ProBlogger is written by two professionals and experts on the act of blogging to generate income; Darren Rowse and Chris Garrett. An updated second edition of this book was released in April 2010, although now a year later the industry has changed further, as it continuously does. Nevertheless, ProBlogger is a great how-to guide for those who aren't quite as business-savvy when it comes to blogging as a means for regular income. From instructions on how to channel and find your blogging "niche", to selecting the perfect blog platform to social networking, ProBlogger shares valuable tips and tricks of the trade. Stressing on how content is key and touching on SEO strategies, ProBlogger hits the nail on the head -- although much of it is common sense for those who regularly spend their time online reading and writing blogs. A book like this is extremely time-sensitive, especially with online power-houses around like Google that change algorithms and SERP practices often, which I do fully support. After all, content truly is key and skilled writers will always prevail in the end as they rightly should. I did gain knowledge of Google Trends, which can be used to manipulate traffic to your site if utilized in a tasteful fashion. Verrrrrry interesting. 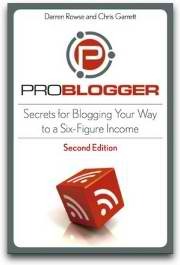 Do I recommend reading ProBlogger ? Yes, perhaps to those just starting out in the blogging world, but not to those who have already been writing and managing their own blogs. The book contains a lot of redundant information that can already be found online from numerous different sources. I started reading this a few weeks ago and lost interest. The first few chapters were pretty obvious to anyone who's been blogging for any amount of time, as you mentioned. I need to pick it back up and see if the later chapters are any better! Well, in all actuality, I don't think you personally, need to pick this up...you'd be better off visiting the ProBlogger website and reading tips there or just googling anything else you need to know! The book truly is basic for bloggers who've been doing it awhile.